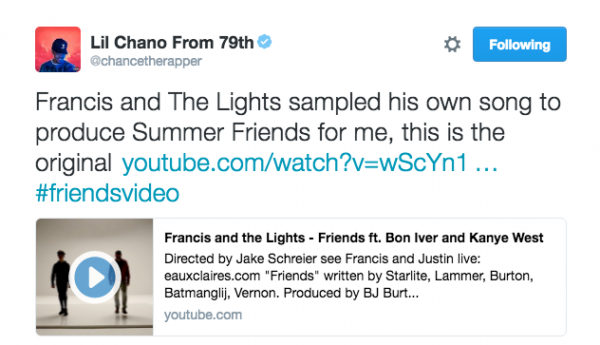 Watch Francis and the Lights Join Forces with Bon Iver and Kanye West for "Friends"
Francis and the Lights returned earlier this year with a feature on Chance The Rapper’s Coloring Book, and he followed it up with a brief but fantastic track recorded in Justin Vernon of Bon Iver fame’s living room. Now he’s gearing up to release more music of his own, and his first proper release is absolutely stacked. Featuring both Bon Iver and Kanye West, “Friends” is one hell of a proper return for Francis. “Friends” is a gorgeous reminder of what Francis is capable of, with and without other artists. The song also features some other impressive credits, too, with writing credits coming from Rostam Batmanglij and Ariel Rechtshaid, and production from Cashmere Cat and Benny Blanco among others. The video, which was directed by Jack Schreier, features all three artists moving around dancing, mouths shut. It’s a striking, minimalistic video, but it suits the track wonderfully. Watch the video for “Friends” above.